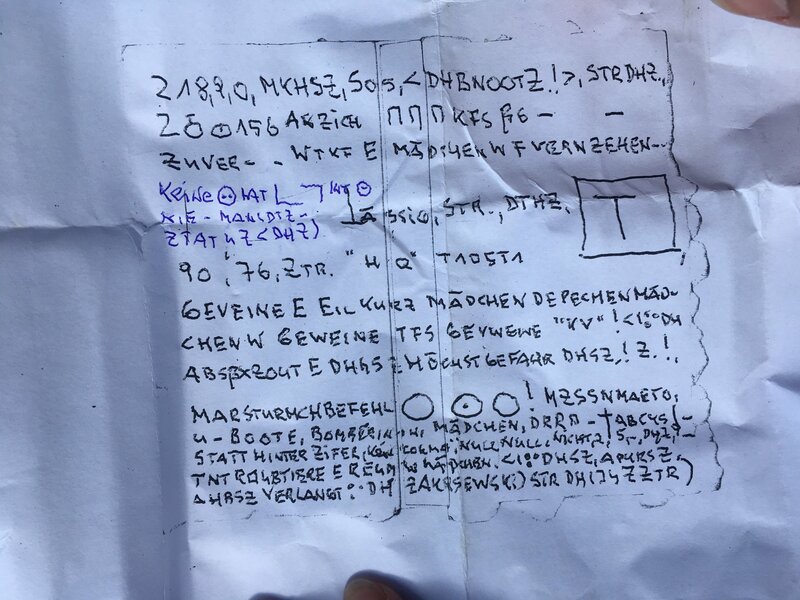 A sixth encrypted bottle post has been found in the river Alster in Hamburg. Still, nobody seems to have a clue what these strange messages mean. In October 2016, an encrypted bottle post was found in the Isebekkanal, a sidearm of the river Alster in Hamburg, Germany (thanks to Dominique Eggerstedt for the hint). On January 24, 2017, a similar message was discovered on the South-East bank of the Außenalster, near the Restaurant Kajüte (thanks to Alex Vladi for the hint). In late April 2017, Tuncel Biyikli informed me about another bottle post. 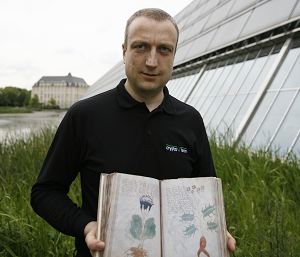 He found it on the eastern bank of the Außenalster. 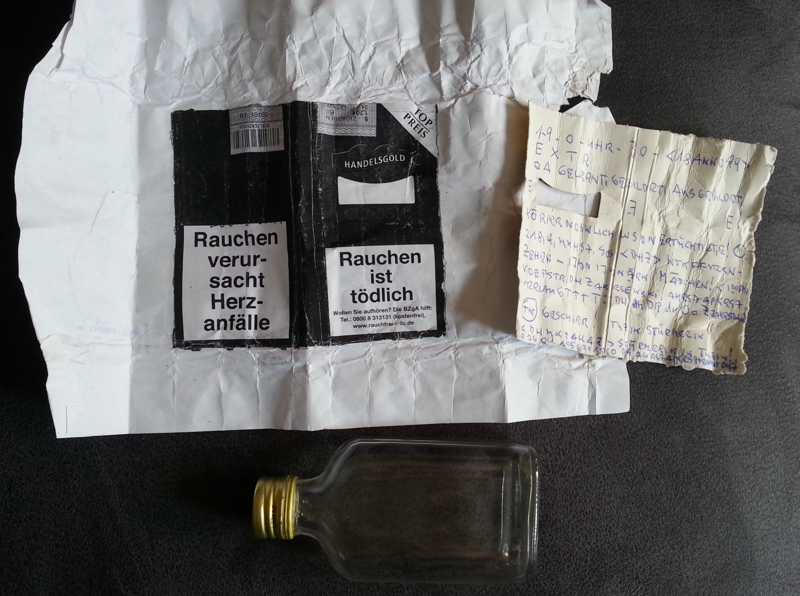 In September 2017, Hans von Jagow sent me a picture of another bottle post of the same kind. He found it drifting on the water while he was rowing near the Krugkoppelbrücke, which is close to the finding place of bottle 3. 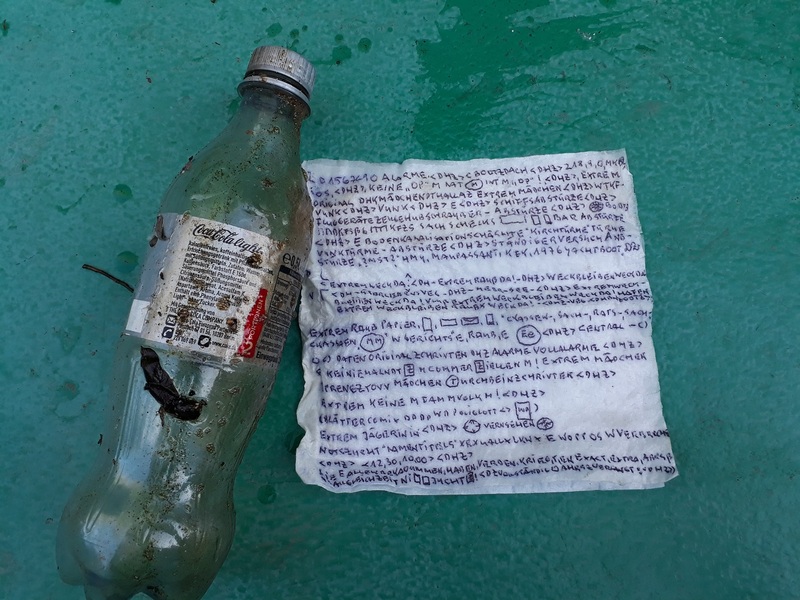 In May 2018, Katrin Reischert informed me about a bottle post she had found a year before in the Isebekkanal, near the Bundesstraße, next to the Kaiser-Friedrich-Ufer (Kaifu). Yesterday I received another mail from Katrin Reischert. She has recently found another bottle post. Again, the finding place was the Isebekkanal, next to the Kaiser-Friedrich-Ufer. Many words can be read, while other parts of the text seem to have no meaning. 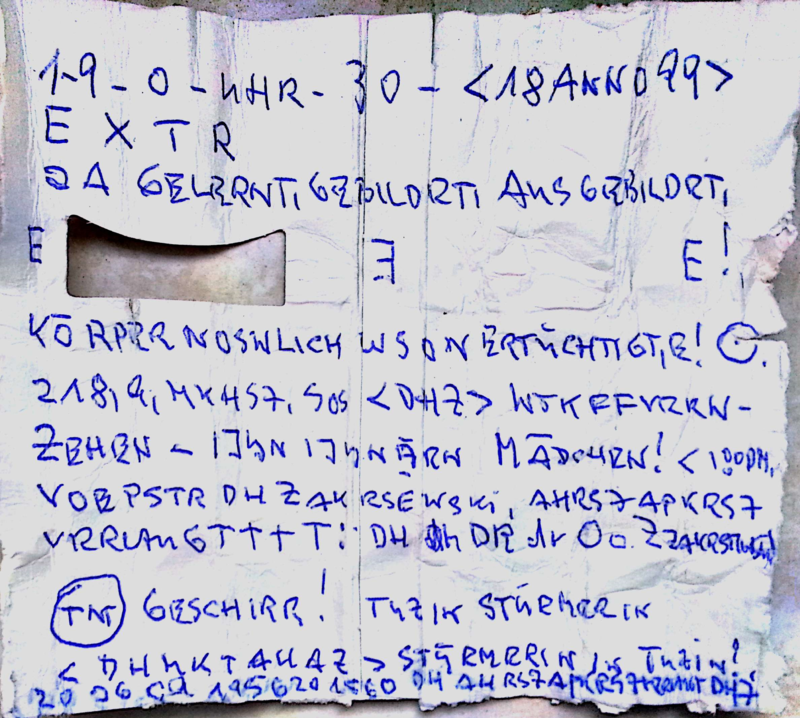 Again, the message contains a number of German cleartext words, e.g., MÄDCHEN, STURMBEFEHL, and HÖCHSTGEFAHR. Like the other three Alster bottle post messages this one consists of letter sequences, the purpose of which is unclear. A number of German words can be spotted, e.g., UBOOTE and DIEGRÖßTEN. Like the four other bottleposts, this one contains an encrypted (?) 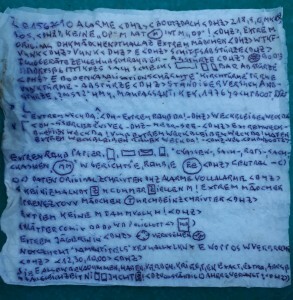 text with many German cleartext fragments. Among other words, I can read SCHNELLBOOT, POSTFINANZ, and MÄDCHEN. 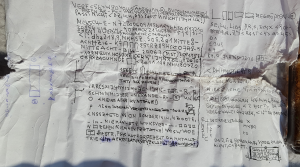 All in all, this cryptogram looks pretty similar as the ones already known. Alternate Reality Game (ARG): ARGs usually start with messages (e.g. letters) being sent to selected people. These messages typically contain a call to action (e.g., “we need your help to save the world, call 123-456-7890”). 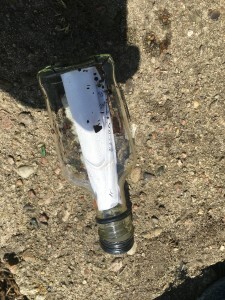 While it seems well possible that the organizers of an ARG use bottle posts to start their game, none of the messages found so far contains a call to action. 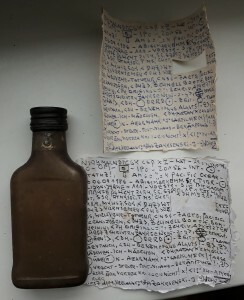 Perhaps, the bottle post messages played a role in a later stage of an ARG, when some instructions about how they had to be interpreted were already known. 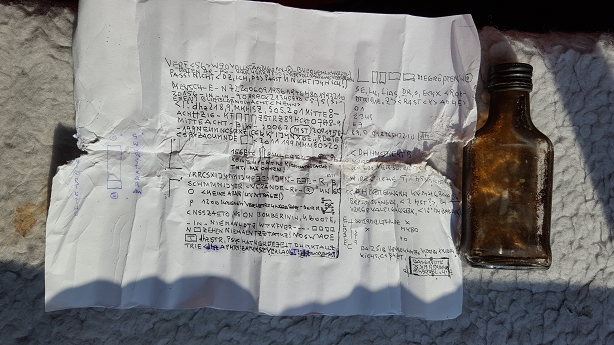 Geocaching: Many crypto puzzles created today have a relationship to Geocaching. Is this the case here, too? 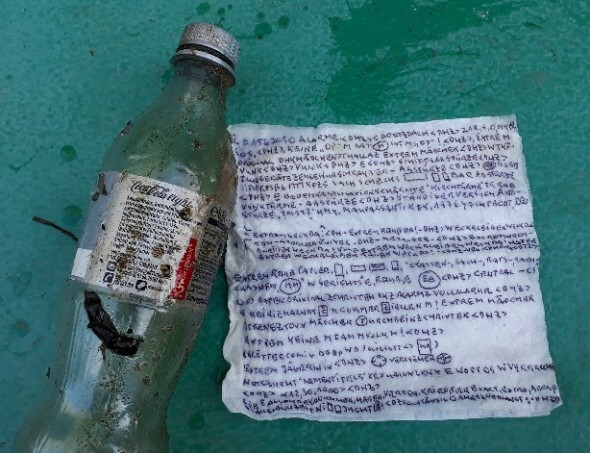 To be honest, I can’t see how these messages fit into a Geocaching scenario (locating a bottle post using a GPS doesn’t make much sense). 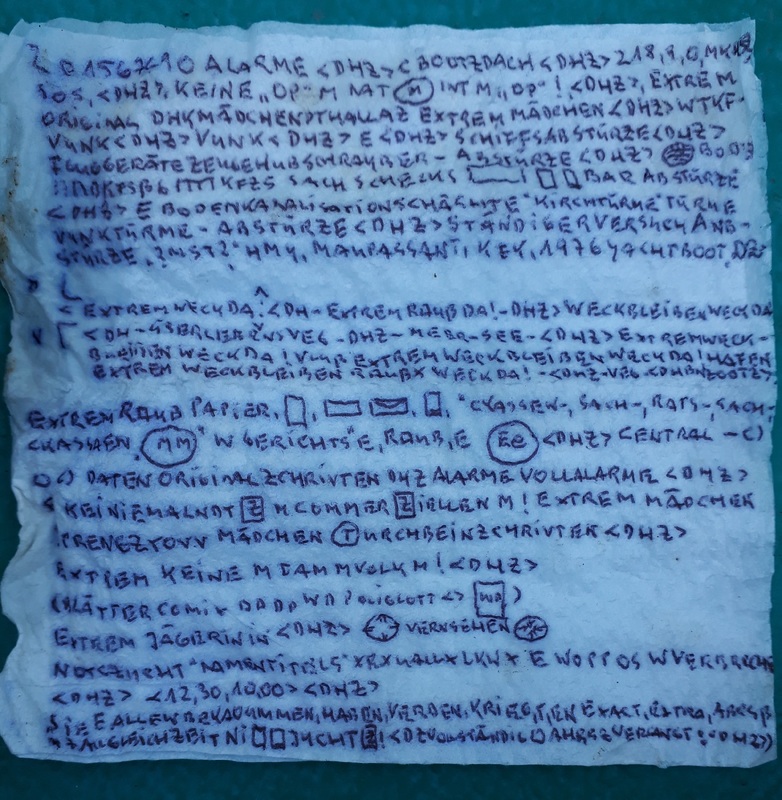 Performance art: A few years ago some 20 encrypted notes were found at a university in London, Canada. In 2014 it became known that these messages all were created by a local artist. So, the crypto mystery turned out to be a performance art project. 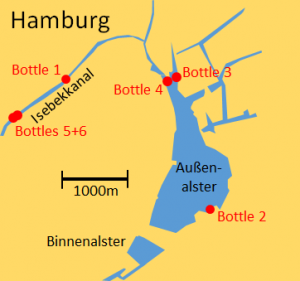 It is, of course, possible that the Alster bottle post mystery has a similar origin. 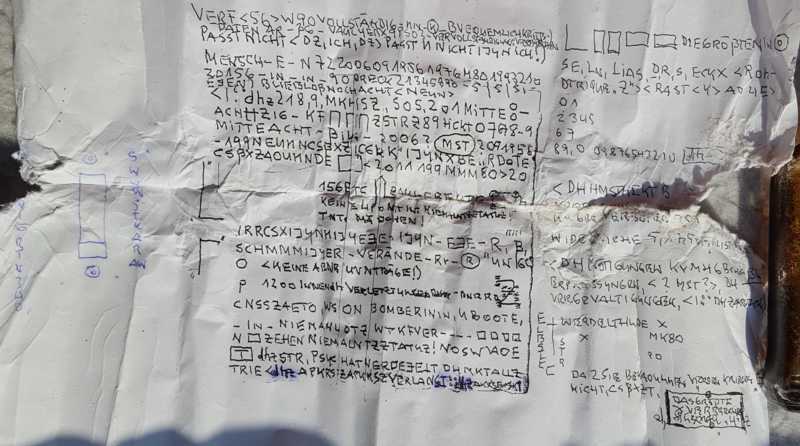 Hoax: Somebody might have created theses messages just to create a mystery – and to make himself laugh about the people trying to solve it. 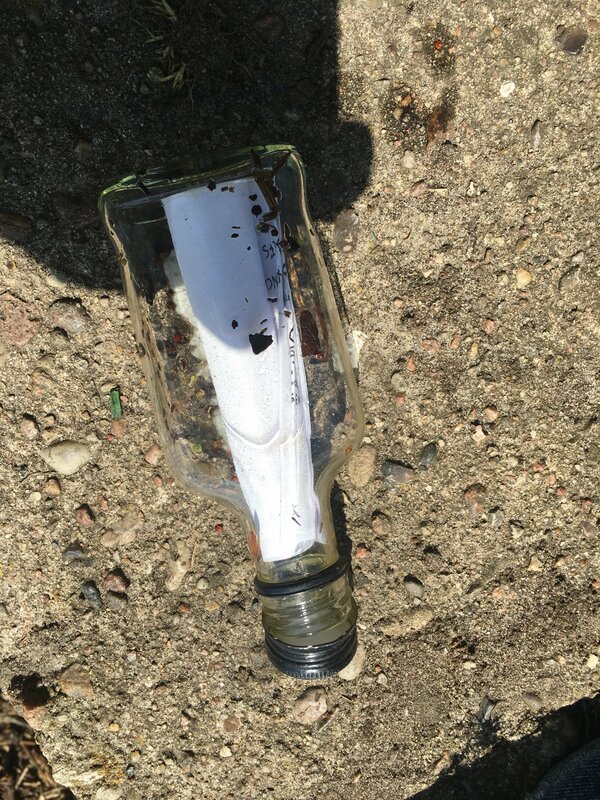 Can a reader say more about the Alster bottle post messages? Any hint is welcome. 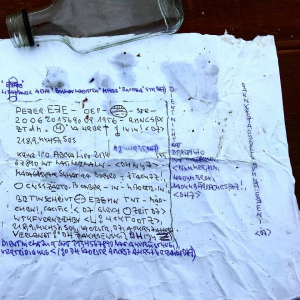 Further reading: Kaliningrad’s second mystery: Who can break this encrypted bottle post? Trump and Pence recently signaled in a meeting by drinking the “Fabled Water Of Life”. Pence was hesitant, but copied the movement to lower his to the floor as well. They were both deciding something together by signalling & sipping a water bottle, setting them off to the sides of the table. The two water bottles are a coded message to initiate the plans encoded in these same bottled ciphers. They are given to US Military and UK Military through the old drop and run game….published in the news, they provide a source for the observation of them in Germany, where a powerful network of tellecommuncations are set up there in a base. Last time he called it a “Big Nothingburger”, “Calm Before The Storm” and then afterwards the “UBOOTEN” and “BOMBERININ” codes were used to detonate a bomb on the ARA San Juan. Where did we JUST SEE that in the news? Elon Musk’s bigtime “blowup” during the Thailand Cave Adventure. He plans to use this “Elon-gated” Silver Tube to carry a device to the base of the tectonic break in the Island’s Southern most sections. 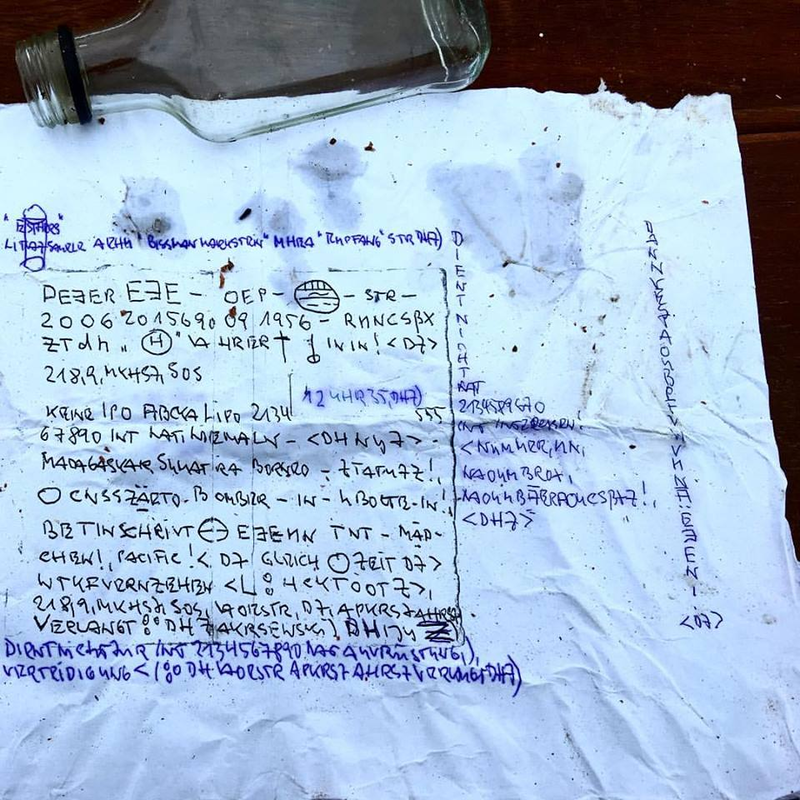 I seeing this as a very lame attempt at creating a real code to work about a “Treasure Map” that has been crafted from a “War Room” atmosphere, have looked deeper. The targets are shown in the map. Hope you can catch the bad guy Klaus…. Overlays are shown as reference points on the map and matching the sites on the Island, near the Puna Plant when zooming in for a closer look. Device is being set on the lower left hand side in the water with the tube Elon designed…..noting the direction was cut off by the lava for the delivery of the other location’s device, they tried to move a device in through HILO….the overall shape of the map being that of a Truck Stick Shift Handle, with a High/Low Switch…..
Who do you call when you find out something like this?